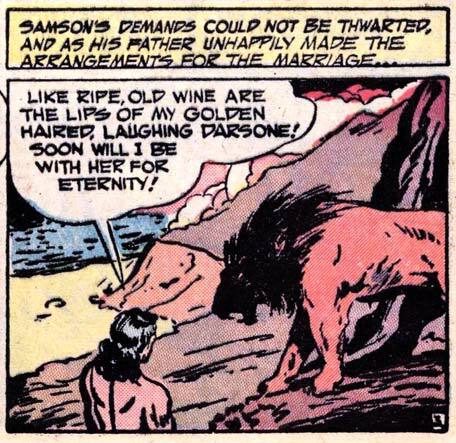 Remember that time Samson fell in love with a lion? Wait, what? 9 Responses to Remember that time Samson fell in love with a lion? Wait, what? I’m guessing by the hair color that this isn’t OUR Samson? Right, this is the Biblical Samson. Who apparently loved a lion before Delilah. Ok i understand that times was hard times. Samson don’t find woman in the desert, and sometimes the animals is good for something. – But this lion is a male lion…. Darn it, Samson, take some “pride” in yourself. Why do I get the feeling that this was Scar from the Lion King? Sorry to burst the bubble, but he didn’t love it. He did with the lion what our Samson does with buildings. EnderX: Setting aside what “actually” happened, it’s hard to read the given panel in isolation without thinking he’s talking about the lion. Which is kind of the point — it’s funny when taken out of context. Putting it into context kind of nullifies the humor value. I guess the Cranberries were right about the animal instinct. Ah the good ole days when you could stuff the hind legs of a wild animal down your loin cloth and let their squirming do the work for you.